strive to provide personal service and attention to detail, guaranteeing each family the caring, friendly service we would expect for our own families. Our Victorian home, built in 1874 for a local sea captain and his wife, is comfortably appointed to afford our families a warm and relaxed atmosphere to gather and visit with family and friends. 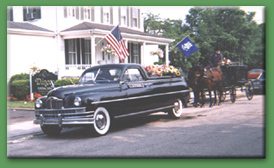 Private, ample parking facilities in a neighborhood setting in Historic downtown Mystic are unique features of our location; just far enough away from the bustle, of commercialism on Route 1, and just one block West of the infamous, "Mystic Drawbridge". As a family-owned firm our Licensed Directors have personally assisted the families in our community for over 35 years. Anthony C. Dinoto, owner and director, our office staff, Susan Dinoto and Carol McGuire, full time director's assistant, Brian Holt; as well as several long-time part-time assistants; all strive to make your experience with us as easy and comfortable as possible. Being family owned allows us to take a sincere, no-pressure interest in our families and to provide you with a clear knowledge of all of your options. Unlike other local firms and so-called "Cremation Societies", we are not required to meet the goals and expectations of Corporate Conglomerates, whether public or private, which are far removed from the local area and YOUR needs. We are personally committed to providing quiet, personal service and relaxed professionalism, devoid of the impersonal, high-pressure service found at other firms. 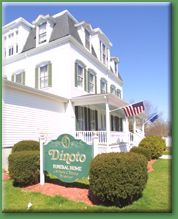 The Dinoto Funeral Home strives to remain competitively priced in every aspect of funeral service, whether your choice is burial or cremation. Additionally, we strongly encourage you to obtain and compare the "General Price List", "Casket Price List", "Urn Price List" and "Outer Burial Container Price Lists" from any & all firms that you may be considering. Please call our office for our informative, NO-obligation Pre-Arrangement Packet which contains all of the above mentioned information which we will be pleased to mail or reserve for you to obtain at your convenience. Our office hours are Monday through Friday 9:30-am until 4:00pm. The funeral is a summary of one's life and should express their individuality. Our goal is to ensure that your family and the loved one you bring to us is cared for with the utmost dignity and respect.